The GPS-50-2 was completely Designed and Built in the USA, specifically made for the custom automotive market and the unique challenges which exist. Highly advanced electronic and software design allow the GPS-50-2 to work unlike anything else, with accelerometers and predictive software to compensate for times when GPS inherently struggles: overpasses, mountains, tunnels, heavy tree cover, large buildings, passing large vehicles, etc. Unique electronic architecture provides for negligible current usage when off, yet lightning fast start-up and signal acquisition. Updating the speed information 10 times per second provides tremendous accuracy, while the integrated omni-directional antenna provides for a wide range of installation flexibility. 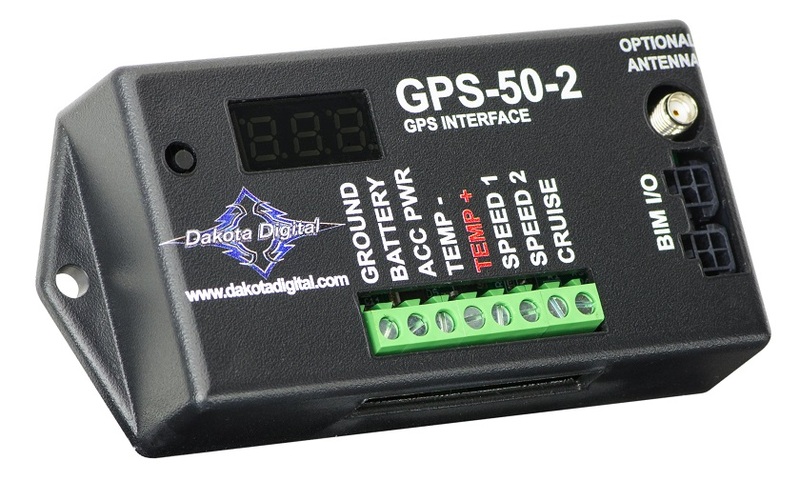 When used in conjunction with a Dakota Digital VFD3, VHX or HDX Instrument system, a simple connection to the control box adds accurate Speed information, Compass heading, Altimeter data, and automatic Clock syncing, all with fully automatic calibration! No DIP switches, no guessing, no inaccuracies, period. 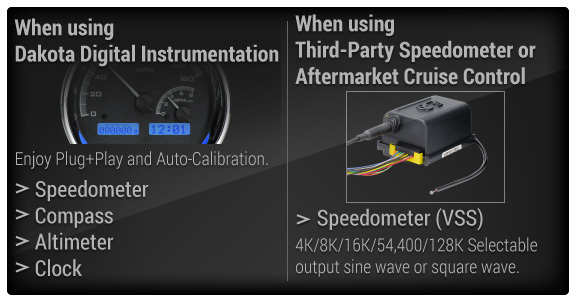 The GPS-50-2 is also fully compatible with other aftermarket electronic speedometers. Offering a user selectable output of 4k, 8k, 16k PPM signals and a selectable signal type of a Sine Wave or Square Wave, the flexibility is endless. While the GPS-50-2 is not designed to control a shift computer or shift pattern of the transmission, it is capable of supplying a 54,400 or 128K PPM signal to supply an ECM to ease some of those unique transmission swap situations! The GPS-50-2 measures in at an easy-to-hide size of 4-3/4”x2-3/4”x1”, and is completely covered by a two-year warranty from the manufacturer. Compatible Dakota Digital instrument systems consist of all VHX or HDX Hybrid Digital/Analog system, as well as VFD3 systems with a BIM-compatible black plastic control module. Earlier instrument systems with an aluminum control module will not be capable of the BIM connectivity, however can be used with the GPS-50-2 for obtaining an accurate speedometer signal.